28apr11:0013:00Kamera Kultura: European Parliament and circularitysunday 28 april 11pm - 1pmGenre:TalkshowTickets € 15 p.p. Please note: Dutch will be the main language during this programme, unless international guests are being interviewed. On the last Sunday of April, Kamera Kultura will focus on the elections for the European Parliament. What is the impact of this parliament on us as Europeans? Presenter Jellie Brouwer will talk to expert guests on the subject (keep an eye on this site for names and more information). And there will be the usual ingredients for a successful Kamera Kultura: inspirational discussions, a column by a prominent writer, live music and a delicious assorted brunch at Juni Café. European elections are due to take place at the end of May. How do these elections affect us as Europeans? Why are they important? Jellie will raise these questions with a person who knows the answers better than anyone: Kati Piri. She has been representing the Dutch Labour Party in the European Parliament since 1 July 2014. This Dutch politician of Hungarian descent is highly praised for her work on migration issues and her influence as a Turkish rapporteur. Two years ago, she was ranked eleventh on the list of most important Euro-parliamentarians, compiled by the Brussels newspaper Politico. Rik Maarsen calls himself a ‘circular designer’. The designer, who graduated from the Design Academy Eindhoven last year, puts his social involvement into practice in a range of different projects. 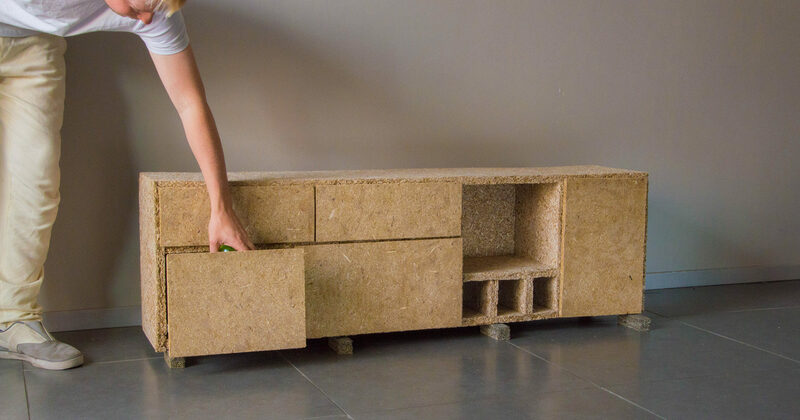 One of them is entitled Landscaped Furniture: furniture made from Dutch agricultural waste. At the end of its serviceable life, the furniture is simply returned to the ground it originally came from. It is a way of looking after the landscape, rather than exhausting it for the sake of production. Jellie will talk to Rik about this work and ambitions. Joost Oomen is a poet, writer, performer, musician and programme maker. This versatile multitasker has published two compilations of poetry: Vliegenierswonden and De stort. An Italian translation of his novella De zon als hij valt, about a journey that a boy, a girl, an eye and a wrist make in order to be together, is due to be published later this year. Joost is also an accomplished performer, having appeared at the Crossing Border Festival and Lowlands. It is now the turn of Kamera Kultura, where he will present one of his columns in person. High time that the French chanson was introduced at Kamera Kultura! Sunday tranquillity, spring fever in April, the intimacy of Juni Café and an inviting fresh buffet: the scene is set for a captivating, melancholic, romantic dialogue. And this is something you can safely leave to singer Wendy Maria Dekker and pianist Anton Titsing. Performing under the name Chansons d’ Anton & Wendy, this musical duo plays minimalist versions of prestigious numbers. From Brel to Piaf, on an otherwise ordinary Sunday morning. Mention Indonesia to a large proportion of the Dutch population, and they see an idyllic holiday destination where you’re served drinks in coconut shells. But behind this squeaky-clean travel guide image lies a history that has shaped our complex cultural identity. Even today, the legacy of the colony is still very much in evidence – in the Netherlands, in Indonesia and in the stories featured in the exhibition Indo, Indië, Indonesië: through the eyes of generation NOW. In 1808, the Governor-General of the Dutch East Indies Herman Willem Daendels ordered forced Indonesian labourers to build the Grote Postweg. Over two hundred years later, Eric Kampherbeek biked along this infamous colonial road connecting East and West Java, taking pictures of daily life along the way. The photographer discovered just how clearly the colonial past is still echoed in present-day Indonesian society. He noted his findings in letters addressed to his dead grandmother, who came to the Netherlands as an Indonesian-Dutch woman after independence. Why didn’t the Netherlands try to help earlier? The ‘widows of Rawagede’ court case immediately raises this question. On 9 December 1947, Dutch soldiers executed 431 men in the village of Rawagede on West Java. For decades, the Netherlands tried to play down this incident but in 2009, a group of elderly widows pressed charges against the Dutch State. 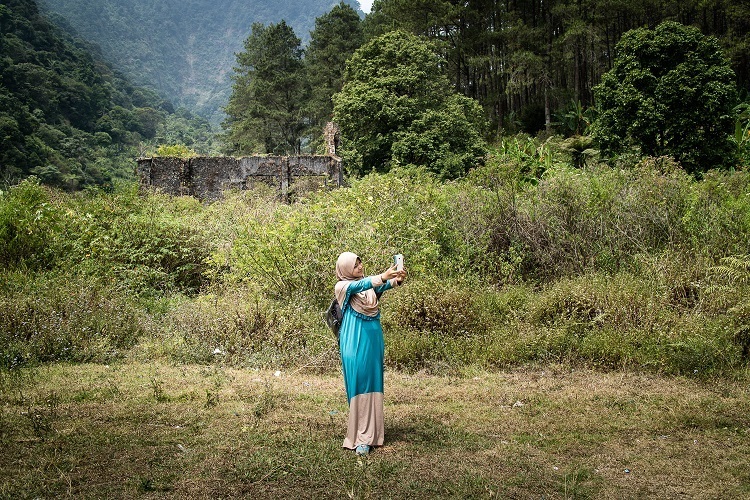 Photographer Suzanne Liem made portraits of the women pressing the charges, who won their case and inspired widows from Sulawesi to seek justice too. For many Indonesians, their colonial past lives on not only visibly, but also invisibly. They believe that the spirits of the Dutch still roam the ruins of the colonial buildings. The occupiers, who managed to instil a serious inferiority complex into several generations, are still very much present in the country and lives of ordinary Indonesians. The Jakarta-based artist couple Irwan Ahmett and Tita Salina discovered the ultimate embodiment of the power of the invisible in a famous Indonesian film actress: Suzzanna van Osch (1942 – 2008). The ‘Queen of horror’ speaks to us through an installation comprising holograms and video footage. Lara Nuberg, best known for her blog Gewoon een Indisch meisje (An ordinary Indonesian girl), worked in and around The Hague for her project. But the stories that this writer and podcast maker collected reach much further than this. Her audio installation Het Rood-Wit-Blauwe Huisje (The Red-White-Blue House) consists of five short stories, some amusing and some moving, which can be seen as a fleeting or more serious comment on being Indonesian in the Netherlands. Her interviewees include first, second and third generation Indonesian Dutch people, who talk openly about subjects such as homesickness and nostalgia in Indonesian families and dealing with a complex cultural identity. Cultural identity is also the main theme of an extensive live programme. In collaboration with the Migration Museum and The Hague Freedom Weeks, Het Nutshuis is organising a varied range of interactive programmes including films, interviews and workshops. You can find all the events in our agenda. This project was realized with financial support by Stroom Den Haag. Please note: the exposition is closed on Friday 29 March from 1pm till Saturday 30 March 4pm. 03may18:0022:00TransitieCinema: Soyalismfriday 26 april | dinner 6pm | movie starts 7.30pmGenre:GuestDiner € 12,50 p.p. In a world struck by climate change and overpopulation, food production control is increasingly becoming a huge business for a handful of giant corporations. Following the industrial production chain of pork and the related soybean monoculture, from China to Brazil through the United States and Mozambique, the documentary describes the enormous concentration of power in the hands of these Western and Chinese companies. This movement is putting out of business hundreds of thousands of small producers and transforming permanently entire landscapes. Launched in United States at the end of the Seventies, the system has been exported across the world, especially in large-populated countries such as China. 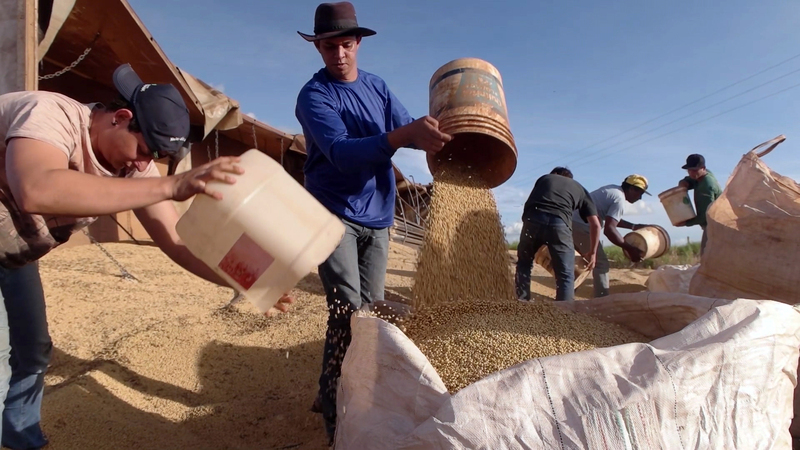 From waste-lagoons in North Carolina to soybeans monoculture developed in the Amazon rainforest to feed animals, the movie describes how the expansion of this process is jeopardizing the social and environmental balance of the planet. TransitieCinema is a monthly documentary event organized by volunteers. Movies about sustainability and transition are screened in Het Nutshuis. Information about the film will follow soon on this page. As follow-up to the movie there is further discussion with the audience about the topic and its relevance for The Hague. E.g. by a Q&A with experts or a workshop. Admission is free. The evening starts at 18.00 with a vegan sustainable dinner by Cafe Juni (optional). At 19.30 the movie screening starts (and the doors will be closed). After the movie there is room for further conversation with a drink. The event is in English, but Dutch subtitles are included if available. You can support and sponsor TransitieCinema through donation. Or co-operate as organization with us to highlight a relevant topic through a movie. For more details please check the TransitieCinema website. Most people either don’t notice them, swat them away or cruelly stamp on them: insects. But these tiny creatures actually deserve our praises or even a medal. Without insects, many of our crops wouldn’t thrive. Without insects, the soil would be infertile. In fact without insects, would there even be life? Nobody knows the answer to this question, but one thing is patently clear: insects are vital – including in our cities, and yes, also in The Hague. Bring the family to Het Nutshuis between 24 May and 17 August to take a closer look at these wonderful, useful urban bugs. Nature lovers and environmentalists have already sounded the alarm: over three-quarters of our insect population has disappeared in the past thirty years. The main causes are the loss of their habitat and the use of pesticides in intensive farming. These developments mean that it is essential to take good care of an alternative natural area: our cities. Our organic Nutshuis garden, with beehives and a pond, form the ideal spot for a family exhibition entitled Urban bugs. Six Graphic Design students from the Royal Academy of Art, The Hague, have created installations featuring four different insects: the woodlouse, the moth, the wild bee and the ant. 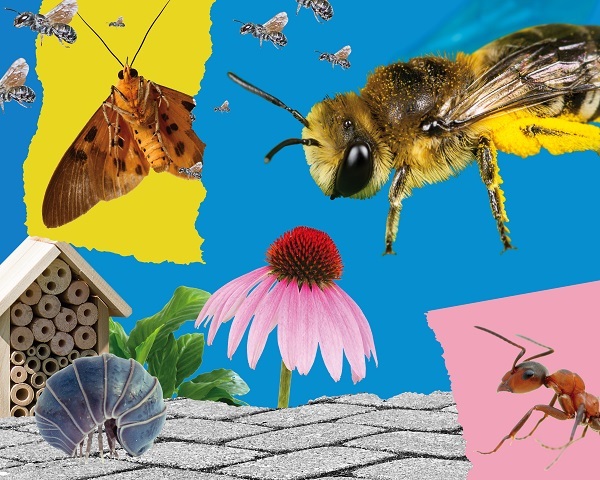 Texts, pictures and assignments explain how these tiny creatures help to keep our cities healthy and what you can do to improve life for insects. For example, did you know that ants are the most efficient refuse collectors known to man? In Manhattan, ants remove almost a thousand kilos of rubbish from the New York streets every year. Woodlice are also good at waste collection, but this time in the soil. These grubbing ‘land-based marine creatures’ loosen the earth and make it more porous for rainwater. And we all know about the role that wild bees play in pollinating and perpetuating many types of fruit and vegetables, but do you know what we can do to cheer up our wild bee populations? Stop mowing all the grass in our cities to within a millimetre of its life, and leave some of it to develop into flower-laden meadowland. This will also help the moths that pollinate the white campion, a common urban perennial. The exhibition at Het Nutshuis also features The Hague-based artist Hans Eijkenboom, who has built an enormous insect hotel in the Nutshuis garden, where a wide diversity of urban bugs can come and ‘chill’. Insects from outside The Hague also make an appearance in this exhibition. Sonologist Yvonne Freckman recorded insect sounds on the borders of South-Africa and Botswana for her audio-installation Sonic Savannah. Alongside the creative assignments in the exhibition itself, Het Nutshuis is also organising twelve children’s workshops on Wednesday afternoons. So budding insect investigators between 6 and 12 can come and meet our friendly bee colony, explore life below the surface and go on an exciting ‘bugventure’!